As of this posting, we Game of Thrones viewers will have one more episode until the hiatus between Seasons Four and Five. 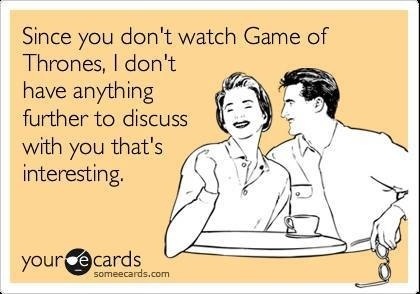 I’ve been enjoying this season (if enjoying is the correct word… you know what I’m talking about) but I’ve also enjoyed listening to my favorite Game of Thrones podcasts. In the show’s first season, there was only one podcast that I knew about (I acknowledge that there might have been many, I was just unaware.) Now there are too many to possibly listen to. 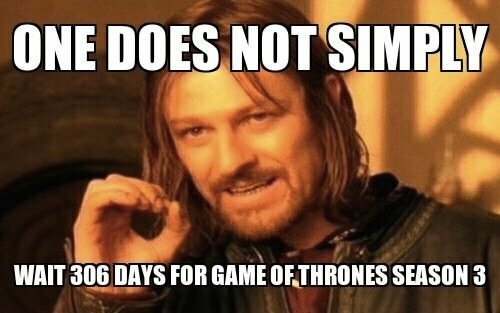 Right On, Ned! Err, I mean, Boromir. One great thing about podcasts, they are there just waiting for you to listen, even when you’re in the off season. I’m happy to go back and listen to podcasts for past seasons. The great thing about show-based communities: they often can remain very active while waiting for the next season. If you’re looking for another podcast to throw onto your queue, here are some details for one that I started listening to during Season Four. In general, the Natter Cast is a television-discussion podcast where the hosts focus on specific shows during the broadcast run, with room for movie discussions, topical events, etc. Look, I don’t want to limit the things that they might natter on about. The hosts, Jason and Sion Shankel, along with their regular and guest cohosts, have excellent banter with easy-going participation from all involved. The active and chatty community was my motivation to start listening to the Natter Cast coverage. I can’t understate how great they are at nurturing a community of discussion among their listeners. They’re extremely engaging and interactive. To be fair, at this point I have only heard the Natter team’s Game of Thrones podcasts; but I’m interested in going back and experiencing their True Detective-focused coverage and I’m looking forward to what they have coming on the horizon. Jason refers to the Natter Cast as “the people’s podcast“, and I agree. They’re well organized and nigh-professional while also having a grass-roots vibe. Not only do they interact on their Facebook pages, they’re keen to present viewpoints and questions from their listeners, which can be a significant part of a podcast. Fair warning: the first Natter Cast GoT podcast that I listened to included a discussion on stuff that cannot be unheard. I will not elaborate. Spoilers? They keep it spoiler free until the very end of each podcast, when it’s made explicitly clear that they’ll be talking future plot points and give any Unsullied a chance to stop listening. Jason is currently reading the last two books (I assume using the Boiled Leather suggested reading), but apparently is okay about spoilers. Hearing his reactions to the spoiler commentary from his cohosts is pretty interesting. Website: http://www.nattercast.com – just go there and check them out. Again, I won’t elaborate. There’s no need for me to re-inflate my head to huge superego size. A Cast of Kings – fantastic high-quality dialogue between an Unsullied show-watcher and a Sullied book reader. (Maybe I shouldn’t have called Joanna Robinson “sullied.” I meant it in a good way!) They’re great, but I’m ridiculously biased. GeekNation Game of Thrones Recap and Review – part of a professional podcasting group. The discussion isn’t super in-depth or insightful, but they had NATHAN FILLION on the last podcast. Beware of spoilers. They claim not to be spoilery, but their resident book reader can’t help herself. I swear. SpecficMedia’s Beyond the Wall Podcast – Another great grass roots “People’s Podcast” podcast. Best experienced live via their Google Hangouts. Non spoilery and super in-depth. Kind of the polar opposite of GeekNation’s podcast. 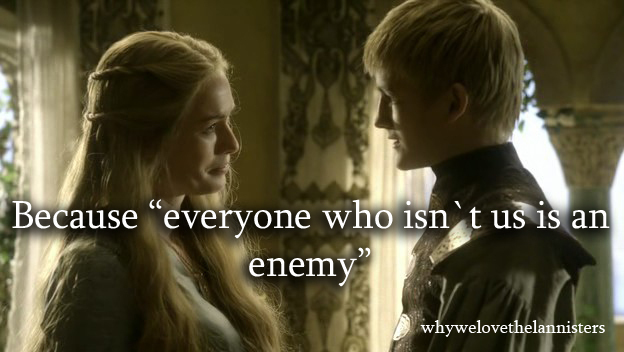 The Joffrey of Podcasts – Seriously, the BEST podcast (from King Joffrey’s point of view.) Started out in the off-season as a collection of humorous sketches, and morphed into a solid recap podcast. I don’t even know how that happened. But I’m proud to wear my TJoP t-shirt. Tuning Into Sci Fi TV Bonus Game of Thrones Podcasts – TISFTV is a venerable podcast covering genre-television, and their bonus podcasts focusing on Game of Thrones are solidly enjoyable. There’s a strong bias against the books, the host prefers her experience to be defined by the show, so that makes for interesting listening. A Storm of Spoilers – found on the Fighting In the War Room podcast feed (just subscribe for the youthful karma) this podcast is solidly for those who’ve read the books, read the wiki, or just don’t care about being spoiled. One more episode for Season Four. I make no claims to the images, but some claims to the text here. So there.